Business & Commercial Services (BCS) provides a wide range of services to individuals and companies who conduct business within Arkansas, whether they’re based inside the state or elsewhere. BCS is Arkansas’s starting point for entrepreneurs wishing to transact business in the state. Consumers can search for a unique name for their company as well as file the appropriate document types for their business. The BCS Division also records trademarks, files notary public certifications, issues Authentication of Documents and Apostilles, and records Uniform Commercial Code (UCC) Filings. You can reach the Business & Commercial Services (BCS) office by calling 888-233-0325 or 501-682-3409 or by e-mail at corprequest@sos.arkansas.gov. The office is located in the Victory Building at 1401 W. Capitol Avenue, Suite 250, Little Rock, AR 72201. Act 857 of 2017, the Entrepreneur Fee Waiver Pilot Program, provides that you may be eligible to have your filing fee waived. Click here to visit the Arkansas Development Finance Authority website for more information on this program. Find domestic or foreign corporation, LLC forms, fees and procedures and pay online or print out and pay by mail. All companies that are registered in Arkansas are required to file either a franchise tax report or an Annual report depending on what type of entity they are. These forms may be filed online or by mail. Foreign and Domestic Nonprofit registrations, Search for and register Charitable Organizations. Notaries Public for the State of Arkansas are recorded and certified by the Business and Commercial Services (BCS) department. 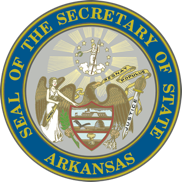 Organizations that place foreign exchange students in Arkansas schools are required to register with the Secretary of State's office. Frequently asked questions for the Business and Commercial Services (BSC) department.